CEO Chick Chat with Svetlana Kim and More Big News You Can Use! ≈ Comments Off on CEO Chick Chat with Svetlana Kim and More Big News You Can Use! Imagine immigrating to a new country with $1 to your name and starting a new life. What would you do, how would you do it and where would this daring adventure take you? Join us for a fascinating interview with Svetlana Kim; the author of White Pearl and I: A Memoir of a Political Refugee, which chronicles her journey from Russia to the United States. Svetlana immigrated to the US with only one dollar in her pocket and a few words of English at her disposal. Today, she is a leader among her peers in the business world, and has been honored with numerous awards citing her commitment, skill, and integrity. Svetlana is an entrepreneur and community leader. You will not want to miss this fascinating and compelling interview that will inspire you with hope and passion that will be imbued in your own life. To learn more and register online! big, Big, BIG just got bigger, Bigger, BIGGER!!!! Join us for a fabulous Bloomies in the City AFTER PARTY at Bloomingdale’s. You will be spoiled rotten, entertained and treated to mimosas, makeovers, treats and a stupendous goodie bag all provided by Bloomingdale’s of Tyson’s Corner! Even if you didn’t make it to the movie you can still purchase an ‘after the movie ticket’ to join us in the fun at the after party. How cool is that?! Purchase your raffle tickets and you will have a chance to win a pair of Jimmy Choo shoes, a Samantha or Charlotte basket, special gifts from HBO or many other prizes to be announced. The best part is you don’t even have to be present to win. When you purchase your raffle tickets online or at the movie, you will be entered to win one or more of the many fabulous prizes. Sign up now because you won’t want to miss out on this bigger, bigger, BIGGER event!!! 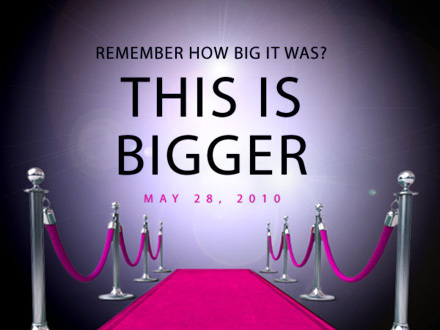 Friday, May 28, 2010 | 9am – ??? To learn more and register! SAVE THE DATE FOR THESE INCREDIBLE EVENTS! Thank you to our sponsors who make entertaining you all the more fun! This new series from Success in the City TV features 15 women at the top of their fields discussing how they made the journey. The interviews include Eva Neumann of ENC Marketing, Brenda Blisk of Blisk Financial Group, and more! Click here to view the series! The more pertinent question for us might be — how do you get to the corner office? The journey to the corner office is of course different for every woman. Yet when we started asking women about how they arrived in their figurative (and in some cases literal) corner offices, some very interesting similarities emerged. See for yourself! 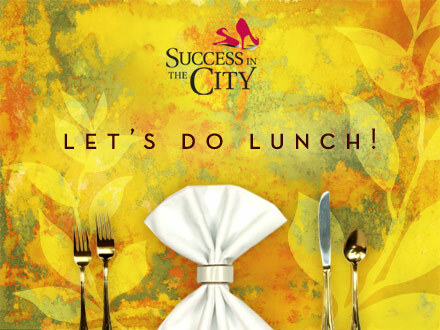 Success in the City TV has just launched the “Corner Office” series of conversations. Click here to view the series. To give you even more reason to watch these incredible interviews, submit your answers to the following questions by Thursday, November 12th and win a FREE, CUSTOM TWITTER BACKGROUND courtesy of Pink Collar Ink! Q1: Which woman is not an MD but is known as a kind of doctor? Q2: Which woman is still figuring out the nuances of Twitter and how it affects her industry? Q3: Which woman modestly attributes her career to a series of coincidences? Watch the interviews to learn about this group of incredible women and get the answers to our challenge! Good luck! An Incredible Washington Business Journal Advertising Opportunity! Only seven spots remain in our full-color, two-page spread! Where the divine meet to dine! Have fun, make friends, change the world, it’s easy! All you need to join is join a Success in the City committee. Get involved, it’s easier than you think! Our Annual, Quarterly and Monthly Sponsorships are now open! Now you can show and tell the women who lead Washington that you are here and ready to serve! Did you know that members of Success in the City can register and attend NAWBO events at member rates and vice versa?! Membership does have its privileges! ≈ Comments Off on Just The Facts Ma’am! Just the facts ma’am! Don’t you get the sense that from the moment we get the kids back in school someone yells go and we are expected to put on our stilettos and run like mad? With so many incredible event offerings it’s almost impossible to choose. We thought you might appreciate a brief summary of the September and October run-down for addition to your calendar. Access National Bank and Signature Kitchen, Bath and Closets. Obviously these businesses have excellent taste and good judgment! Cynthia de Lorenzi likes to call herself a serial entrepreneur and social commentator on the status of women in our world today. She also encourages the label “open networker” and, just for fun, “Diva Extraordinaire.” Washington Business Journal selected her as one of the top 25 “Women Who Mean Business” in 2006 and SmartCEO awarded her the BRAVA award in 2009. Her organization, Success in the City has been featured in the Business Section of the Washington Post, NPR, DC Modern Luxury Magazine and Washington’s Finest. As founder (in 2004) and chief executive officer of Success in the City, Ms. de Lorenzi leads an unconventional business networking organization for senior level executive businesswomen in the DC Metropolitan area. To help foster meaningful peer relationships and friendships among members, Success in the City’s format tosses creative and fun events as well as professional development discussions into the menu of opportunities to connect. Ms. de Lorenzi maintains that when women are given the opportunity to “really” connect on a dynamic personal level, personal growth as well as consummating “deals-on-heels” is assured. More than a thousand women have participated in SITC events. She has partnered with EFX Media to launch Success in the City TV, an Internet TV network for women’s groups and organizations and her newest partnership and endeavor Pink Collar Ink Publishing.